Praise the Lord. When good things happen, who do we praise? When we see blessings in other people’s lives, who do we praise? For the people in Naomi’s life, the answer is that they praised the Lord. 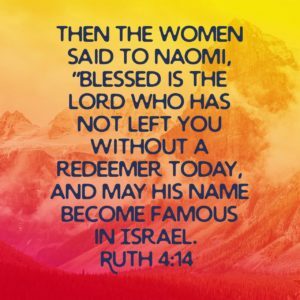 Read Ruth 4:14. The women saw all the amazing things that had happened to Naomi and to Ruth and the result was they praised God. It’s really interesting that they didn’t praise Boaz. That might have been an easy and natural thing to think of to do because Boaz was the one who actually redeemed them and who married Ruth. But, the women saw the greater hand of God moving through all the circumstances that brought them together and as a result then gave the praise and the worship to the Lord. Do we see God’s hand in the circumstances and situations around us? Do we praise Him for what He does, or do we focus our praise on the people instead? True, people must be obedient to God’s will, but ultimately, it is God who works through the situations to achieve His will.